What is a logic model or how is it defined? Why use a logic model for developing a program evaluation? What are the basic elements of a logic model? How do you read a logic model? 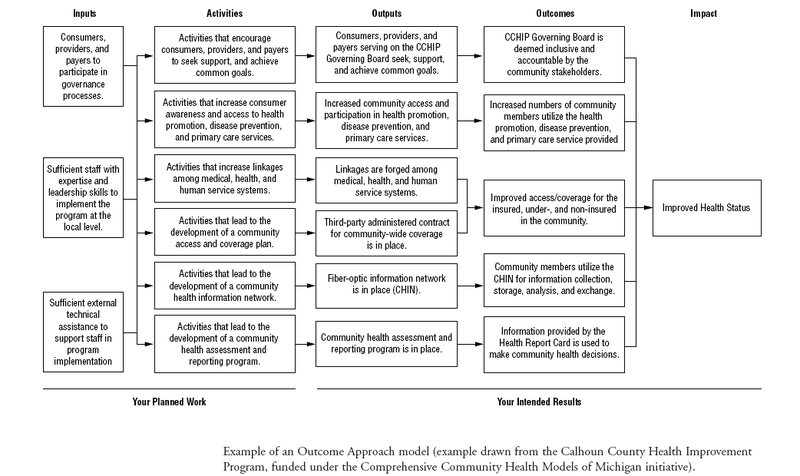 A logic model is a relatively simple image that reflects how and why a program will work. Logic models are useful to program administrators who are trying to implement changes in their program. Creating logic models in a group brings the power of consensus and group examination of values and beliefs about change processes and program results. Logic models are actionable plans, strategies or maps with clear outcomes and explicit steps for solving program problems. Below is an example of a fully developed logic model (click to enlarge). Use a logic model to help generate the clarity and specificity required for success and often demanded by funders and constituents. Logic modeling can enhance a practitioner’s ability to plan, design, implement, analyze, and generate knowledge. The process of developing the model is an opportunity to chart the course. It is a conscious process that creates an explicit understanding of the challenges ahead, the resources available, and the timetable in which to hit the target. Additionally, it helps to focus on the big picture as well as the component parts. Constructing a logic model should be part of an ongoing process of discussion, commitment, and reflection as part of an organization’s dedication to program improvement and accountability. The logic model process serves as the starting point for this conversation and can later be considered the “report card” that you might use to understand whether or not you are meeting your program goals and objectives. 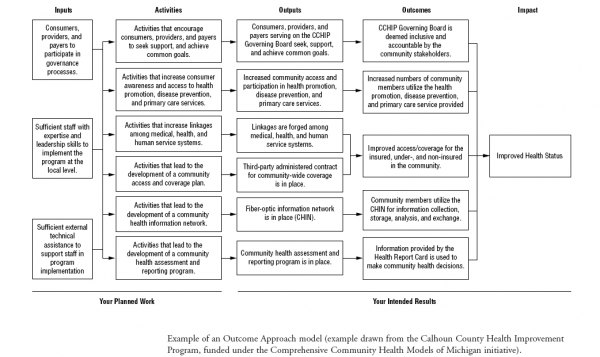 Logic models can be developed to meet large or small-scale outreach program goals. They should be revisited on regular basis and should closely reflect the goals of your college preparation program and evaluation plan. Finally, logic models can illustrate how access programs are part of the strategic and ongoing access, retention, and success conversation within an organization. The basic elements of a logic model in the diagram below are designed to develop a structured, framework for your evaluation plan. The Source: W.K. Kellogg Foundation , Logic Model Development Guide, p. 1. “Your Planned Work” – This describes what resources you think you need to implement your program and what activities you intend to use. Resources (inputs) – program assets, participants’ entry level characteristics, etc. 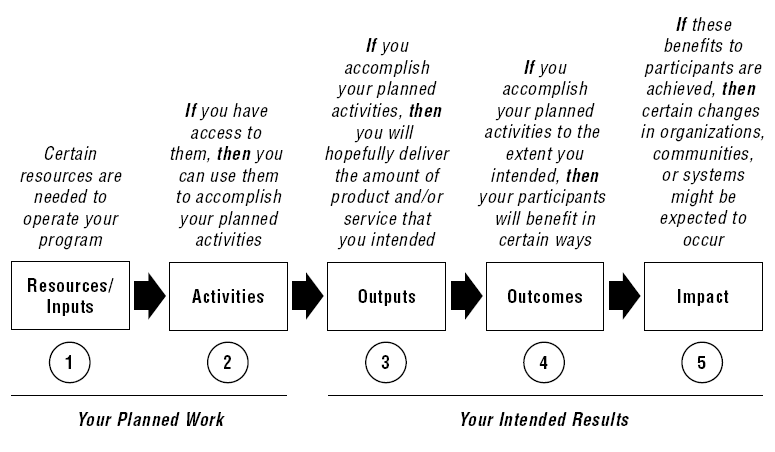 ”Your Intended Results” - This includes all of the program’s desired outputs, outcomes, and impact. A logic model is read from left to right. As you read through the chain of reasoning (the “if…then” statements) the connection amongst program resources, activities, outputs, outcomes, and impact should become apparent. The image below will help you understand how to properly read a logic model. Source: W.K. Kellogg Foundation, Logic Model Development Guide, p. 3. If at any point, as you read through the logic model and the reasoning does not follow, it could mean one or more elements of the planned work in the program design does not strategically lead to an element or elements in the intended program results. Carefully reading through the logic model is a prime opportunity to revisit the overall program design to make sure the program is fully equipped to achieve its goals. It is better to encounter inadequacies during the logic model planning stage than during the actual program implementation. On the other hand, if problems are encountered during the actual implementation of the program, revisiting the logic model can be an invaluable tool for helping to identify where a disconnect or mistake in the chain of reasoning in the program design has occurred. Both major and minor disconnections in program resources or activities with the program outputs or outcomes should be taken seriously and addressed in the logic model. A heplful exercise is to ask someone not connected to the program to read the logic model using the “if…then” statements. You and your team may be so close to the inner workings and expected outcomes of the program that you see connections in the logic model that may or may not be there. A more objective observer could better catch any disconnects in the flow of the reasoning. It is good to put your logic model to the test.